For the girl who has everything, priced at £15 each. Click the image to go to the Nails Inc Christmas Shop. For the girl who has everything. 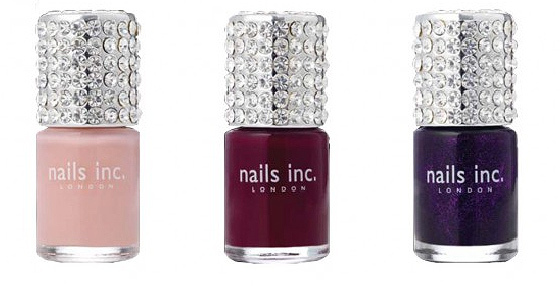 Collect all 3 of these irresistible new shades with gorgeously glitzy crystal caps. These are the perfect stocking fillers and are the ultimate accessory for your dressing table. Snap up all 3 and treat someone to an extra special gift this year. I can totally see this filling stockings up and down the country. I have about a million purple polishes of that colour (a good few which are by NI). You’d think that I wouldn’t want this new one..how wrong you’d be. It shall be mine! I saw these…they stressed me out. I’d rather buy 3 x Models Own polishes than 1 x £15 Nails Inc. Pretty bottles though. Wow these look gorgeous! Im a sucker for anything sparkly! @DINKY London – Completely pointless. So, I’m sure they’ll sell like hotcakes! @Rhamnousia – A woman on a mission! @Helen – Don’t let the polish stress you out!! You have a wedding to fulfill that job! I’ve never tried a Models Own polish, but your posts are making me want to!! Even better Id rather buy 5 x Barry M nail polishes for £15 than 3x Model’s Own or 1x Nails Inc !! Although that bottle is amazing!